Rice biologists have a problem. Rice is a staple food for more than half the world’s population and a combination of population growth and land lost to urbanisation means that by 2050, rice yields have to increase by over 50%. Unfortunately, pushing up rice production has become increasingly difficult. Between 1970 and 1990, rice yield per hectare grew at an average of 2.3% a year. In the 1990s, that fell to 1.5% and between 2000 and 2010, the yearly increase was less than 1%. The numbers suggest that biologists need new approaches and one of the boldest being tried is the C4 Rice Project. The project, involving an international consortium of researchers, aims to boost yields by half by creating rice that uses highly efficient C4 photosynthesis. C4 photosynthesis evolved as a patch to fix a fundamental flaw at the heart of normal photosynthesis. During photosynthesis, plants capture carbon dioxide from the air and use it to build sugars. Unfortunately, the enzyme that first binds CO2—called RuBisCO—sometimes binds oxygen by mistake. When this happens, it triggers a series of reactions called photorespiration that costs the plant both energy and carbon (released as CO2), effectively undoing the work of photosynthesis. Given equal amounts of CO2 and O2 this would not be much of a problem. RuBisCO is much more likely to bind CO2. But RuBisCO isn’t given an even choice—there’s far more O2 than CO2 in the atmosphere. Things get worse as the temperature increases. 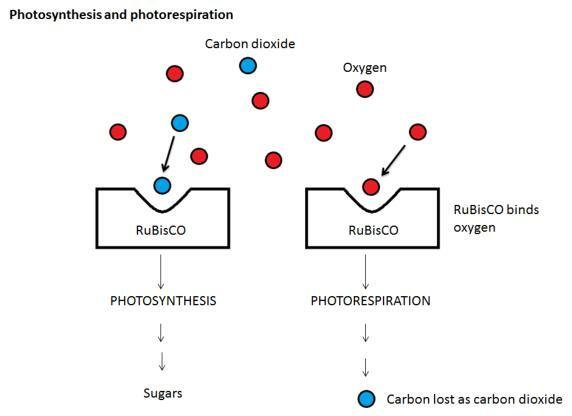 When it’s hot, RuBisCO is more likely to mistake O2 for CO2, and the solubilities of the two gases shift, increasing the ratio of dissolved O2 to dissolved CO2. At temperatures above 30˚C, this can mean photorespiration reduces the net rate of photosynthesis by over 30%. Photorespiration occurs in all plants that use the conventional photosynthesis process. The first products detected after RuBisCO fixes CO2 are 3-carbon molecules, and so this is known as C3 photosynthesis. Some plants, however, escape the problem. Instead of using RuBisCO to capture atmospheric CO2, these plants use an enzyme that doesn’t bind oxygen. The enzyme fixes CO2 in a reaction that transforms a 3-carbon molecule into a 4-carbon molecule—hence the name, C4 photosynthesis. C4 plants haven’t abandoned RuBisCO. C4 photosynthesis is effectively the normal, C3 version of photosynthesis, but with the addition of a CO2 pump. The pump operates across two types of cell. First, mesophyll cells in the leaf capture CO2 to produce 4-carbon molecules. These are then exported to neighbouring bundle sheath cells, which strip CO2 from the 4-carbon molecules and feed it to RuBisCO. The process converts the 4-carbon molecules to 3-carbon molecules, which are recycled back to mesophyll cells to help capture more CO2.The C4 mechanism can pump up the concentration of CO2 around RuBisCO more than tenfold, making it highly unlikely that RuBisCO will bind O2 rather than CO2. The process is often compared to a turbo-charger, which increases an engine’s power by pumping air into the combustion chamber. C4 also has other advantages. The boost to photosynthesis means C4 plants can use less RuBisCO than C3 plants, saving on the nitrogen needed to build the protein. In addition, C4 plants can survive on a lower overall CO2 concentration in the leaf, allowing them to keep stomata partially closed and so save water. Researchers estimate that in semi-arid, warm regions, C4 allows plants to increase net photosynthesis by around 50%. Interestingly, a mechanism called CAM (Crassulacean Acid Metabolism) that is similar to C4 has evolved in desert plants. CAM plants open their stomata at night and fix CO2 into 4-carbon molecules. During the day, they close their stomata to save water, and release CO2 from the 4-carbon molecules to allow photosynthesis. 4 photosynthesis—maize, sugar cane, sorghum and millet. What must the C4 Rice Project achieve to allow rice to join this group? “We are in year four of what was estimated to be a 20 year project,” says Julian Hibberd, of the Department of Plant Sciences at the University of Cambridge. According to Hibberd — a member of the Project—the current focus is to discover if it is possible to change both rice biochemistry and the structure of rice leaves to a more C4 type. Comparing the leaves of maize (C4) and rice hints at what is needed. 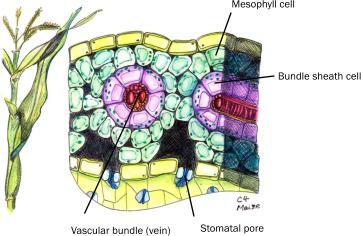 Rice leaves have widely spaced vascular bundles (the veins) surrounded by bundle sheath cells. In between are large numbers of mesophyll cells where most photosynthesis takes place. Maize has closely-spaced veins, each wrapped in two concentric layers of cells—an inner layer of bundle-sheath cells and an outer layer of mesophyll cells. This arrangement is called Kranz anatomy (from the German for ‘wreath’). 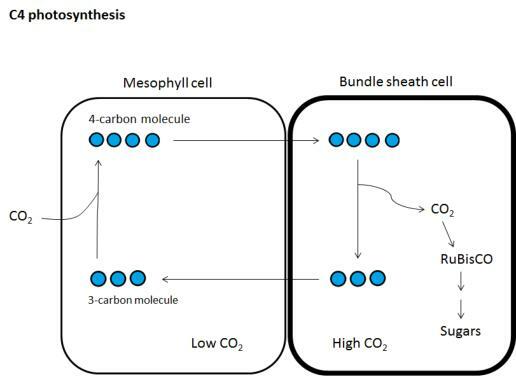 It separates the fixation of CO2 into 4-carbon molecules in mesophyll cells from its use by RuBisCO in bundle sheath cells. Almost all C4 plants have Kranz anatomy, suggesting it will have to be bred into rice. Alongside this, rice biochemistry will have to be rewired to create the CO2 pump. One simple example is in the pattern of RuBisCO activity. C4 depends on RuBisCO being confined to bundle sheath cells—away from the low CO2 concentrations in mesophyll cells. In present day rice, however, most of the plant’s RuBisCO exists in mesophyll cells. “These two traits—biochemistry and anatomy—are both critical for the functioning of an efficient C4 leaf,” says Hibberd. Fortunately, studying the evolution of C4 plants from their C3 ancestors suggests that making the necessary changes may not be as difficult as it seems. Probably because of shift in the balance of CO2 released by volcanism and carbon being buried in sediments, atmospheric CO2 concentrations fell dramatically from about 1200 ppm 35 million years ago, to a low of around 200 ppm 20,000 years ago.3 As CO2 concentrations fell, the problem of photorespiration increased and so did the advantage of C4 photosynthesis. This drove the evolution of C4 species, which now dominate several ecosystems, for example, many types of grassland. Looking at how C4 species are spread across the plant family tree and comparing DNA sequences from different species shows that C4 photosynthesis has evolved independently at least 66 times in different groups of plants. This remarkable case of convergent evolution gives plant biologists many different examples to study. “There is a massive biological resource out there for us to use to understand what it really takes to be C4,” says Hibberd. Researchers are applying modern molecular biology and data analysis to unpick the genetic changes through which C4 plants evolved. So far, their research shows that although each case involves slightly different genetic changes, the end results are remarkably similar in both biochemistry and leaf structure. Currently, researchers plan to genetically engineer rice with genes from C4 plants, such as maize. This means the project will have to satisfy national and international regulatory frameworks on the use of genetic engineering in crops. The research teams involved will also consult with both rice farmers and the public before launching C4 varieties. For more information on rice and a description of the approaches being used to breed better rice varieties, see the website of the International Rice Research Institute: www.irri.org. 1: Hibberd, J.M., Sheehy, J.E. & Langdale, J.A. (2008) Using C4 photosynthesis to increase the yield of rice—rationale and feasibility. Current Opinion in Plant Biology vol. 11, pp 228-231. 2: Khush, G.S. 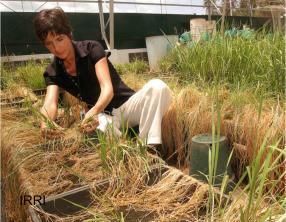 (2013) Strategies for increasing the yield potential of cereals: case of rice as an example. Plant Breeding vol. 132, pp 433-436. 3: Sage, R.F., Sage, T.L. & Kocacinar, F. (2012) Photorespiration and the evolution of C4 photosynthesis. Annual Review of Plant Biology vol. 63, pp 19-47. 4: Jordan, D.B. & Ogren, W.L. (1984) The CO2/O2 specificity of ribulose 1,5-bisphosphate carboxylase/oxygenase. Planta vol. 161, pp 308-313.